Amazing courage. Dr. implants IT device into his own brain! Self-experiments have sometimes led to medical breakthroughs. Last year, Kennedy, a 67-year-old neurologist and inventor, did something unprecedented in the annals of self-experimentation. He paid a surgeon in Central America $25,000 to implant electrodes into his brain in order to establish a connection between his motor cortex and a computer. Along with a small group of pioneers, Kennedy, who was born in Ireland, had in the late 1980s developed “invasive” human brain-computer interfaces—literally wires inside the brain attached to a computer, and he is widely credited as the first to allow a severely paralyzed “locked-in” patient to move a computer cursor using her brain. “The father of cyborgs,” one magazine called him. Kennedy’s scientific aim has been to build a speech decoder—software that can translate the neuronal signals produced by imagined speech into words coming out of a speech synthesizer. But this work, carried out by his small Georgia company Neural Signals, had stalled, Kennedy says. He could no longer find research subjects, had little funding, and had lost the support of the U.S. Food and Drug Administration. Kennedy says his self-experiment was driven by frustration and by scientific questions. 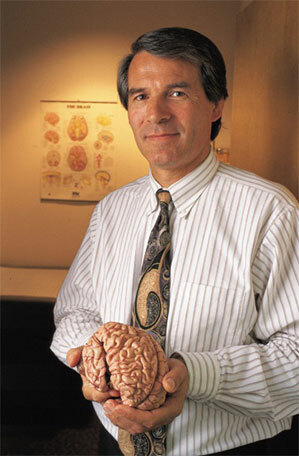 As a young physician, Kennedy was so intrigued by the brain that he returned to school to earn a Ph.D. in neuroscience. While running a lab at the Georgia Institute of Technology in the 1980s, he developed and patented an innovative type of electrode consisting of a pair of gold wires encased in a tiny glass cone. Filled with a proprietary blend of growth factors, the electrode induced nearby neurons to grow into the device. In 1996, after tests in animals, the FDA agreed to allow Kennedy to implant his electrodes into locked-in patients with paralysis so severe they could no longer speak or move. His first volunteer was a special education teacher and mother of two named Marjory, or “MH,” who agreed to undergo the procedure at the very end of her life. Marjory had ALS but demonstrated she could turn a switch on and off just by thinking. But she was so sick that only 76 days later, she died. Next, in 1998, came Johnny Ray, a 53-year-old Vietnam veteran and drywall contractor who awoke from a coma with his mind fully intact but unable to move anything except his eyelids. Kennedy personally oversaw the implantation of the electrodes in at least five subjects, and his team began showing that if it recorded from just a few neurons, patients could move a cursor on a computer screen and communicate by picking words or letters from a menu. By 2004, Kennedy had implanted his electrodes in the brain of Erik Ramsey, a volunteer who suffered a catastrophic brain stem stroke in a car accident that left him locked in at the age of 16. Thanks to the data collected from Ramsey, Kennedy and his collaborators continued to publish high-profile papers on the results in journals like PLOS One and Frontiers in Neuroscience as recently as 2009 and 2011. One paper described how software could pick out the sounds Ramsey was imagining and allow him to very roughly pronounce a few simple words. Eventually, Ramsey became too ill to keep participating in the research. By then, the FDA had also withdrawn permission to use the devices in any more patients. Kennedy says the agency began asking him for more safety data, including on the neurotrophic factors he was using to induce neuronal growth. When Kennedy couldn’t provide the data, the FDA refused to approve any more implants. Kennedy never fully accepted the FDA decision (he took at least one other patient to Belize for an implant). There were also scientific frustrations working with disabled people. Locked-in people can’t communicate, except at times with grunts or their eyes, something that added a confounding variable to his experiments. When a given neuron fired off, he could never be sure what the patient had been thinking. 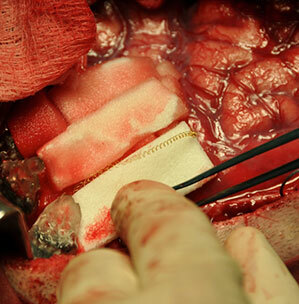 The brain of Phil Kennedy during surgery to install a neuron-recording implant. The surgery took place in June 2014 at a 13-bed Belize City hospital a thousand miles south of his Georgia-based neurology practice and also far from the reach of the FDA. Prior to boarding his flight, Kennedy did all he could to prepare. At his small company, Neural Signals, he fabricated the electrodes the neurosurgeon would implant into his motor cortex—even chose the spot where he wanted them buried. He put aside enough money to support himself for a few months if the surgery went wrong. He had made sure his living will was in order and that his older son knew where he was. The side effects were very serious, but Kennedy says he recovered and returned for a second 10-hour procedure in Belize City several months later so the surgeon could implant electronics that would let him collect signals from his own brain. 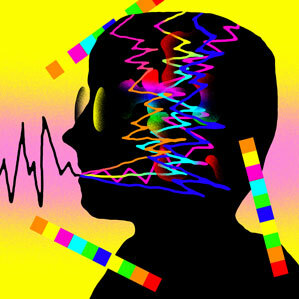 Kennedy says his early findings are “extremely encouraging.” He says he determined that different combinations of the 65 neurons he was recording from consistently fired every time he spoke certain sounds aloud, and also fired when he imagined speaking them—a relationship that is potentially key to developing a thought decoder for speech. At UCSF, Chang says that Kennedy may have learned something new. His own research uses different electrodes placed outside the brain, which he says are able to collect only a “relatively rough” signal (see “A Speech Synthesizer Direct to the Brain”). “I think what he might have access to there is something a lot more detailed,” says Chang. There was one major disappointment. Kennedy had hoped to live with the implants in his brain for years, collecting data, improving his control, and publishing papers. But the incision in his skull never closed entirely, creating a dangerous situation. After a few weeks of collecting data, last January Kennedy was forced to ask doctors at a local Georgia hospital to remove the implants. The bill came to $94,000. Kennedy submitted the claim to his insurance company (he says it paid $15,000).